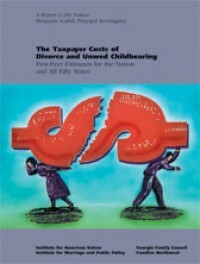 This study provides the first rigorous estimate of the costs to U.S. taxpayer high rates of divorce and unmarried childbearing both at the national and state levels. Based on the methodology, we estimated that U.S. taxpayers were affected at least $112 billion each and every year, or more than $1 trillion each decade. Benjamin Scafidi is an associate professor of economics and finance at Georgia College and State University.